Taffy Abel knew his finest moments while wearing the uniform of the New York Rangers and the Chicago Blackhawks in an era when the National Hockey League was scrambling from an offbeat collection of muscular mavericks to a solid organization. Abel’s fabulous climb from Sault Ste. Marie amateur ranks to the NHL stamped him as a legend in Hockey. He left an indelible imprint in pro and amateur circles as a player, coach and manager. Taffy Abel was a name beloved by hockey followers across the continent in the era of the 60-minute men. He played his first game in Sault Ste. Marie, MI in 1918. Abel carried the American flag as he took the Olympic oath for hockey players in Chamonix, France, in 1924. After a stint with the Minneapolis Millers during the 1925-26 season, he joined the original New York Rangers when the club made its NHL debut (1926-27). Here Taffy played alongside rugged Ivan (Ching) Johnson on the blue line. The first-year Ranger team won its division title and the next year (1927-28) claimed the Stanley Cup. The 1928 Stanley Cup series against the Montreal Maroons was a memorable one in the life of Taffy Abel, for it was during a game in that series that he rose to national acclaim. The goalie for the Rangers was hit in the head with a shot and was removed from the ice on a stretcher. After an attempt by the Rangers to sign a goalie from the stands was nullified, Ranger Manager Lester Patrick donned the pads and stood between the pipes. Abel and Johnson allowed only three shots to be fired at Patrick, playing his first game ever in the nets. Abel also was a member of the 1933-34 Stanley Cup-winning Chicago Blackhawks. For many years, Abel was the only American-born player in the NHL and at one point with the Hawks set an NHL record when he played 100 minutes in a series against Les Canadiens without a substitution. 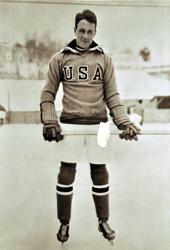 "Like his contemporaries Jim Thorpe, Ty Cobb, and Jack Johnson, Hobey Baker was a fabulous athlete. Like them, he had a great physique, fantastic reflexes, instant coordination of hand and eye, iron discipline and blazing courage. But to these rare abilities, he added another dimension all his own to the public during his career at Princeton and St. Nick's. He was the college athlete supreme: the gentlemen sportsman, the amateur in the pure sense playing the game "Pour le sport”, who never fowled, despised publicity, and refused professional offers." So wrote John Davis in his biography, "The Legend of Hobey Baker." Baker learned early in life the arts of both stickhandling and skating. He was a master at both. Davies describes his play best when he relates: "It was the age of seven man hockey, no forward passing and no substitutions; he played the position of rover, the offensive superstar permitted to roam all over the ice. The typical play was for him to take a rebound at his own end, circle the goal to pick up speed, and then tear down the length of the ice, by the rules unable to forward pass; because of the no-substitution rule and his phenomenal endurance, this went on all night. Because of the further accident that Princeton at the time had no rink of its own, he always played in cities before big crowds; whenever he got the puck and took off, the crowd would jump to its feet and shout, "Here he comes!" Prior to entering Princeton in 1910 Baker attended the St. Paul's School, Concord, New Hampshire where Malcolm K. Gordon, another United States Hockey Hall of Fame enshrinee was the coach. At Princeton he was not only a legend in hockey, but in football as well. He captained the hockey team for two years and the football team for one. In his senior year he even drop-kicked a 43-yard field goal to tie Yale. After leaving Princeton, Baker continued in hockey with the St. Nicholas Club until his entry into the famed United States flying unit, the Lafayette Esquadrille, in World War I. He was killed in a tragic air accident shortly after the end of the war. He was later honored by having an award, the Hobey Baker Memorial Award, given annually to the nation's top collegiate player, a gesture fitting of the type of first-class person both on and off the ice that he was. Baker was also selected to the Hockey Hall of Fame in Toronto in 1945. He went on that season to win the Calder Trophy as the outstanding rookie and the Vezina Trophy as the league’s leading goalie. The Bruins proceeded to capture the Stanley Cup that season as well as in 1941. Brimsek was one of the many players produced by Coach Cliff Thompson, also a United States Hockey Hall of Fame enshrinee, at Eveleth High School. After graduating from Eveleth High School, Brimsek played for what is now St. Cloud State University before launching his post college career with the amateur Pittsburgh Yellow Jackets in 1935-36. He played one full season in Providence of the then International American League, before the call came to Boston. Brimsek captured another Vezina Trophy in 1942 and then served two years in the Coast Guard during World War II. While in the service, he played for the Coast Guard Cutters team which played in the Eastern Amateur Hockey League and was made up of some outstanding American pros. Returning from World War II, Brimsek played until 1950, his last season with Chicago, before retiring. In addition to his two Vezina trophies, he was a first team All Star on two occasions and a six-time second team All Star as well. In addition, he also played in two All Star games. 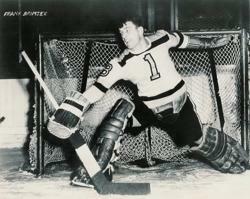 Brimsek had over 10 seasons of regular and playoff action, and goals against average were 2.74 with 42 shutouts. He was also selected to the Hockey Hall of Fame in Toronto in 1966, an honor reserved for just a handful of Americans. In 1910, the Boston Arena was built and with it the Boston Athletic Association (BAA) hockey team. George Brown was the driving force behind this team which played top amateur clubs in the Eastern United Sates as well as leading Canadian and college teams. When the Arena burned down in 1918, Brown formed the corporation which constructed the new Arena. He then managed both the new building as well as continuing the BAA team. This club formed the basis of the 1924 United States Olympic Team with seven of the ten players BAA members. The United States finished second losing only to Canada 6-1 in the finals. Brown was not initially involved in professional hockey, but once Boston secured a National Hockey League franchise, the first United States city to do so, it was not long before he was part of the professional scene. When the Bruins moved into the new Boston Gardens in 1928, he helped organize the Canadian-American League, a forerunner to the present American Hockey League, and entered the Boston Tigers in the league. Brown continued in his positions with the Arena and Gardens until his death in 1937. He was selected as a member of the Hockey Hall of Fame in Toronto in 1961. Following in the footsteps of his father George Brown, also an enshrinee of the United States Hockey Hall of Fame, Walter Brown made great and significant contributions to American hockey, particularly in the area of the international game. Brown coached the Boston Olympics senior team between 1930 and 1940 and won five United States national amateur championships. The pinnacle was reached in 1933 when this team captured the World Championships at Prague as representatives of the United States. Brown arranged a vigorous exhibition schedule for this team both before and after the five game World Championship series. All told, including the World Championships, the team won 44, lost 3, and tied 3. Playing on this team were United Sates Hockey Hall of Fame enshrinees John Chase, John Garrison and Ding Palmer. 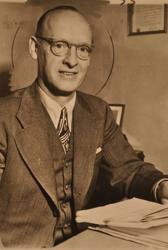 Brown succeeded his father as general manager of Boston Gardens in 1937 and continued a policy of strong support or hockey in the schools and colleges. 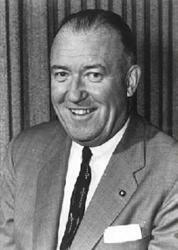 As the years passed his involvement with hockey became deeper and at the time of his death he was president of the Boston Gardens, member of the Hockey Hall of Fame (Toronto) Governing Committee, co-owner and president of the Boston Bruins, and past president of the International Ice Hockey Federation. In 1960, as chairman of the United States Olympic Ice Hockey Committee, he played a significant role in the selection of the gold medal winning United States team. John Chase began his formal hockey career at Milton Academy playing on the 1922-23 team. Transferring to Exeter Academy the following year, he played there one year before matriculating at Harvard in the fall of 1924. At Harvard, Chase’s strength and skill as a hockey player soared. He played as a regular at center ice as a freshman and as a first line center on the varsity for three years. He was selected as team captain his senior year. Chase also excelled at baseball at Harvard and as an amateur player in later years. Following graduation from Harvard, Chase was sought after by professional teams, but he chose instead to pursue a business career. He did, however, continue his hockey career with such teams as the Boston Athletic Association, Boston University Club, and Brac Burn Hockey Club. All were strong contenders because of Chase’s presence in the line-up. In 1932, he captained the United States Olympic Team which captured the silver medal at Lake Placid, New York losing the final game to Canada 2-1 in a heartbreaker. When his playing days were over, Chase coached the Harvard varsity for eight years, 1942 through 1950. Not only was John Chase a graceful, heady player and playmaker, but besides all this, he was a talented coach. Cully Dahlstrom played high school hockey at Minneapolis South and then went on to play for the Minneapolis Millers in the American Hockey Association. The American Hockey Association was a strong minor professional league of that time and sent many promising players into the National Hockey League. It was there that he caught the eye of Major Fed McLaughlin of the Chicago Blackhawks who was always on the lookout for promising American talent. Dahlstrom didn’t let McLaughlin down as he won the Calder Trophy as the National Hockey Leagues’ rookie of the year 1937-38. In the semi-final playoffs against the New York American’s he scored the winning goal in 1-0 overtime victory in the second game. In the finals against Toronto he scored the key first goal in the 4-1 victory which brought the Stanley Cup to the Windy City. In the 1940-41 Stanley Cup playoffs, Dahlstrom once again had a strong series against the Montreal Canadiens. He scored once in a 4-3 loss and then won the series for the Hawks with two goals in the final 3-2 victory. Chicago was subsequently eliminated by Detroit 2 games to 0. Dahlstrom retired after the 1944-45 season. Appearing in 368 regular and playoff games, he scored 94 and 126 assists. Dahlstrom’s most outstanding single season was 1943-44 when he scored 20 goals and 22 assists in the then full 50 game schedule. John Garrison attended the local Country Day School in West Newton and as a school boy there had the unparalled record of playing six years on the varsity! He then went on to Harvard where he was a regular on the Freshman Team and then a varsity regular for three seasons at center ice. Garrison was adept at any forward position as well as on defense. Professional hockey also sought out Garrison, as it did John Chase before him, but like Chase, Garrison preferred to stake out a career in the business world. Amateur and international hockey, however, continued to have a demand on his hockey talents. During the 1930s he led several amateur teams to the United States national title. During these years he gained the reputation as one of the finest amateur players in the nation. 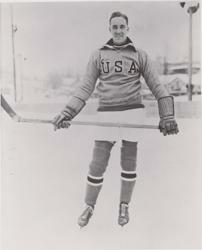 Garrison played defense for the 1932 United States Olympic Team that capture a silver medal at Lake Placid. In 1933 he scored an unassisted overtime goal against Canada to give the United States a 2-1 victory and its first world championship at Prague, Czechoslovakia. He then went on to captain the 1936 Olympic Team which won a bronze medal at Garmish and to coach the 1948 Olympic Team. Gibson, a graduate of the Detroit Medical School, was a fine player in Canada and was prevailed upon by the late Merv Youngs, then a cub reporter and later editor of the Houghton Mining Gazette, to join the Portage Lake (Houghton-Hancock) organization. Gibson was a native of Berlin, Ontario, now Kitchener. The new hockey team, fashioned by the late James R. Dee, was built around Gibson as captain. It was called the Portage Lakers. Their fame reached into Canada and soon they had gained recognition for the roughest, toughest hockey in the world. In 1902-03, a four-team league flourished in the Upper Peninsula (Houghton, Hancock, Laurium, and American Sault). Then in 1903-04 Canadian players began drifting into the Cooper Country, including such greats as Riley Hern, Hod and Bruce Stuart and Cyclone Taylor. Gibson was instrumental in farming these players into the first professional league in the world, the International Hockey League of which Portage Lake was a member. 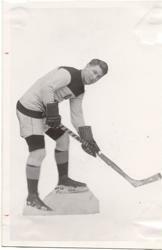 Gibson was the team’s leading scorer, although there is no record of his exact number of goals. The 1903-04 Portage Lake team was perhaps one of the greatest hockey teams of all times. In 26 games it scored 273 goals and allowed only 48. Only twice were they defeated – by American Sault, 7-6, in the regular season and by Pittsburgh, 5-2, in U.S. playoffs. Then the Lakers won from Pittsburgh, 5-1 and 7-0, for the American championship. Later, at Houghton where over 5,000 fans packed the Old Amphidrome, Portage Lake defeated the Montreal Wanderers, 8-4 and 9-2, to lay claim to the world championship. Other teams which bowed to the Portage Lakers were St. Paul, Detroit, Grand Rapids, Cleveland St. Louis and the Canadian Sault. In the spring of 1905, Portage Lake sent word to the Stanley Cup Committee Board of Governors challenging the Ottowa Silver Seven to a championship series and in 1906 they did the same to Montreal. Both refused. It was then, that the Canadian clubs signed away the great Portage Lake players and Gibson returned to Canada to enter the medal profession. 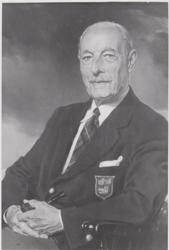 Doc Gibson was inducted into the United States Hockey Hall of Fame as an Administrator. Moose Goheen learned his hockey on the outdoor rinks of White Bear Lake and nearby St. Paul. He was not only a great hockey player but also an outstanding football and baseball performer as well. In the fall of 1915, Goheen joined the St. Paul Athletic Club, one of the strongest American amateur teams of its time. Goheen, along with such other greats as Tony Conroy, Cy Weidenborner and Ed Fitzgerald, helped capture the McNaughton Trophy in 1916-17. This trophy was then symbolic of American amateur hockey supremacy. St. Paul won the cup again the following year as well as the Art Ross Cup from Lacime, Quebec in Montreal. Goheen then joined the U.S. Army for World War I service. Returning in 1920, Moose Goheen led the St. Paul team to another McNaughton Trophy. He joined the first United States Olympic Hockey Team in the same year. Playing at Antwerp, Belgium, the United States skaters won three games by wide margins and lost only to Canada for a second place finish. These games were the only Olympic competition in which seven- man hockey was played. Goheen was unable to play for the 1924 team because of business commitments. He continued with the St. Paul team through 1926 when it turned professional and then on through 1932. Goheen was drafted by the Boston Bruins, and also offered a contract by the Toronto Maple Leafs, but preferred to remain in Minnesota with the Northern States Power Company. He is credited with originating the wearing of helmets to protect sustained injuries. On the ice, old timers remember his as a high scoring defenseman noted for his rink length dashes. He was selected to the Hockey Hall of Fame in Toronto in 1952. The Minnesota Hall of Fame elected Goheen in 1958 as the finest hockey player ever produced in the state. In 1882, Malcom K Gordon arrived as a “new kid” at the St. Paul’s School in Concord, New Hampshire. He not only was an only child and knew no one else in the school, he was a Southerner, dropped down in the heyday of reconstruction into a nest of hostile Yankees. In one of those odd incongruities of life, the Southerner was to play a major role in shaping what is regarded as an essentially Northern game – our great sport of hockey. The game had been earlier introduced at St. Paul’s from Canada, but Malcom Gordon is regarded as the individual who helped formalize the game by putting down on paper what is regarded as the first set of rules in the United States. This occurred in 1885, and in 1888 he was made hockey coach. Play at St. Paul’s was strictly intramural, but in 1896 Gordon took the first St. Paul’s team to New York to play at the old St. Nicholas Rink. In that first game, the St. Paul’s alumni defeated Gordon’s team 3-1. His coaching career extended until 1917 during which time he developed numerous players, including Hobey Baker, for the Eastern colleges. It was such former players who provided the financial backing for the St. Nicholas Rink. Gordon was head of the history department at St. Paul’s and coached football and cricket as well as hockey. After World War I service, he was in the real estate business until 1927 when he founded the Malcom K. Gordon School at Garrison, New York. He served as headmaster until his retirement in 1952, but continued to teach at the school almost to the time of his death at age 96. Eddie Jeremiah entered Dartmouth in 1926 after attending high school in Somerville, Mass., and prep school at Hebron Academy in Maine. He earned nine letters at Somerville, in football, hockey, and baseball, while earning three more in those same sports at Hebron. After picking up two football, three hockey, and two baseball letters at Dartmouth, Jeremiah entered the professional hockey ranks as a member of the New Haven hockey team of the Canadian-American League. He then split the next season between the New York Americans and the Boston Bruins of the National Hockey League. He also spent the 1933 season with both the Boston Cubs and the New Haven team, again in the Canadian-American League. His last year of playing was the 1935 season with Cleveland of the International League. With his playing days over, he went on to become the coach of the Boston Olympics hockey team and guided them to the National Amateur Athletic Union Championship in 1936. He became varsity hockey coach at Dartmouth a year later and served continuously after that date, except for World War II service, until his retirement in 1967. Dartmouth hockey flourished under Jeremiah. In seven of the first nine years Jeremiah was at the coaching helm, the Indians won the Pentagonal League Championship, and, from 1942-1946, won a record 46 consecutive games without a defeat. In addition, he led Dartmouth to the NCAA tournament in both 1948 and 1949, and captured Ivy League titles in 1959 and 1960 as well. 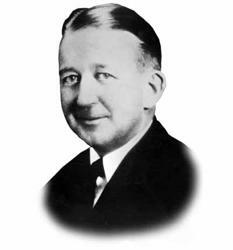 In these decades as Dartmouth's head coach, Jeremiah directed his teams to 308 victories, 247 losses and 12 ties. He remained a Big Green coaching legend throughout his life. Mike Karakas, though born in Aurora was reared in Eveleth, and was the first of a number of players coached by enshrinee Cliff Thompson to go on to stardom in the National Hockey League. Karakas had his first hockey training on the ice in a lot near the Spruce Mine of Eveleth, where he and other sons of Oliver Iron Mining Company (now United States Steel, donators of the site of the United States Hockey Hall of Fame Museum) fought out their hockey battles. He played hockey on the Eveleth High School team for three years, and later, while attending Eveleth Junior College, he joined the Rangers, and amateur club which won the state championship in 1931. Karakas’ work attracted the attention of a scout for the Chicago Shamrocks, American Hockey Association, who sent him to that club. He was used as a back-up goalie that year and as a regular the next. He received the American Hockey Association’s cup as the most valuable goalie in the league. After trying out with the Detroit Red Wings, he was sent to St. Louis, playing there and at Tulsa for the next two years. Both St. Louis and Tulsa were members of the American Hockey Association, then hockey’s top minor league. Karakas joined the Chicago Blackhawks at the start of the 1935-36 season and proceeded to dazzle the opposition by posting a 1.92 goals against average and 0 shutouts over the forty eight game season. This was more than sufficient to gain him the forerunner to the Calder Trophy as the league’s top rookie. 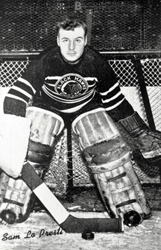 In 1937-38 Karakas backstopped the Hawks to a Stanley Cup victory despite an injury during the final series. He recorded 2 shutouts during the total 9 playoff games. He played with the Blackhawks into the 1939-40 season and ended that year with the Montreal Canadiens. Playing the next three seasons in the American Hockey League with Providence, Karakas returned to the Hawks in 1943-44 and took them all the way to the Stanley Cup finals against the Montreal Canadiens. Though the Blackhawks went out in four straight games, all but the first was close, and Karakas performed outstandingly. The following season, he shared the league leadership in shutouts at 4 with Frank McCool of Toronto as well as being named second team All-Star. After the 1945-46 season, Karakas returned to the Providence Red of the American League where he finished his professional career. Tom Lockhart’s name has been synonymous with amateur hockey in the United States since the early 1930s when he took over the organization and promotion of the game in New York City. Long interested and active as a cyclist, boxer and track competitor, he organized the Eastern Amateur Hockey League in 1933 and in the fall of 1937 founded the Amateur Hockey Association of the United States (AHAUS). The latter, without a doubt, was Lockhart’s greatest hockey achievement. Lockhart and other hockey enthusiasts in the United States realized hockey people were required to run the game efficiently on a nationwide basis. Heretofore, the sport had been under the direction of varying time periods. AHAUS continued to grow and prosper over the years. The first national youth hockey tournaments for boys under high school age were held in 1949. National tournaments in seven different classes were held annually. Back then, youth hockey had displayed a tremendous growth in the country and was then played in 44 of the ‘then’ 50 states. It was estimated that there was over 200,000 players and 11,000 teams competing in formal programs in this country. All a tribute to Tom Lockhart’s vision. Lockhart’s other hockey endeavors involved supervising the New York Metropolitan Amateur League, coaching and managing the New York Rovers of the Eastern Amateur League, and serving as business manager of the New York Rangers. He also served on the United States Olympic Ice Hockey Committee and the International Ice Hockey Federation. 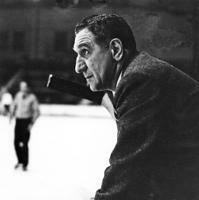 Lockhart was selected to the Hockey Hall of Fame in Toronto in 1965. Myles Lane ranked as one of the Dartmouth College’s greatest athletes of all time. From 1925 until his graduation in 1928, Lane earned three letters in hockey and football respectively, and another in baseball. He was captain of the 1927-28 hockey team leading them to a 6-4 record. Lane gained national prominence by becoming the first American collegian to successfully enter the ranks of professional hockey joining the New York Rangers in 1928. While at Dartmouth, he established records for the most goals in a season by a defenseman, 20, and career goals by a defenseman, 50. Lane was also an outstanding football player at Dartmouth starring as a halfback for three seasons. As a sophomore, he played on the 1925 team which was undefeated, 8-0-0, and acclaimed as national champions. In 1926, the Indians had a 4-4 record, but swept to a 7-1 mark in 1927, losing only to Yale, as Lane scored 125 of his team’s 280 points. He received All-American recognition for his gridiron exploits and is a member of the National Football Foundation’s Hall of Fame at New Brunswick, New Jersey. During his initial professional hockey season with the Rangers, Lane was sold to the Boston Bruins who went on to a Stanley Cup victory over the Montreal Canadians. Lane was a teammate of George Owen, another United States Hockey Hall of Fame enshrinee, on this club. He returned for a portion of the 1929-30 season as well as the 1933-34 campaign. Following his hockey career, Myles Lane went into law and became one of the nation’s most successful trial lawyers and foes of organized crime. Another of Legendary Eveleth Cliff Thompson’s protégé’s, he took over the goalie’s job in his second year out for the high school team. 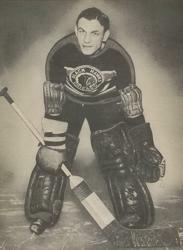 In 1936, LoPresti played in the nets for the Eveleth Junior team, also coached by Cliff Thompson, and the club had one of its most successful seasons. After a year at St. Cloud Teacher’s College, he returned to play for the Junior College. Thompson felt he was a natural in the nets. LoPresti never got flustered when in the midst of a shower of pucks as his record breaking performance proved. In the fall of 1939, the St. Paul Saints sent a scout to Eveleth to dig up some goalie talent. The scout contacted Thompson who promptly recommended LoPresti. From St. Paul, which played in the American Hockey Association, it wasn’t long before he found himself in the Chicago nets when Paul Goodman retired. LoPresti played through the end of the 1941-42 seasons, when he entered the U.S. Navy. He was aboard a merchant ship that was torpedoed in February 1943 and spent 42 days in a lifeboat before being rescued. After the war, LoPresti played senior amateur hockey in Northeastern Minnesota before retiring from the game. Sam was inducted into the U.S. Hockey Hall of Fame in 1973. His son, Pete, also went on to prominence as a goaltender, later starring for the hometown Minnesota North Stars in the 1970s. 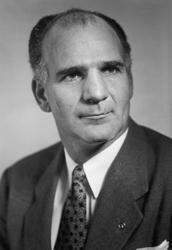 The name of John Mariucci is indelibly etched into the history of American hockey as well as that of his native Minnesota. He did, in the words of an old but appropriate cliché, become a legend in his own time. Mariucci was another Cliff Thompson coached player who went on to bigger and better things. After attending high school in Eveleth he went on to the University of Minnesota where he starred in football as well as on the ice – even leading his squad to an undefeated AAU National Championship in 1940. Turning pro that year, Mariucci played briefly for Providence of the American League before joining the Hawks for the balance of the season. In Chicago he became a fixture manning the Blackhawks defense until the end of the 1948 season and eventually becoming the team captain in the process. Never one to back away from a fight, the hard rock Mariucci was second in penalty minutes during the 1946-47 season gathering 110 to Toronto’s Gus Mortson. Before retiring after the 1951 season, he played for St. Louis in the American League and Minneapolis and St. Paul in the United States League. 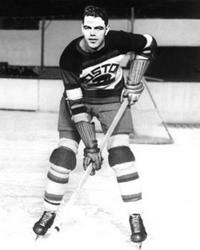 During World War II Mariucci also played for the Coast Guard team in the Eastern Amateur League. Returning to his alma mater as varsity hockey coach in 1952, Mariucci piloted the Gophers through the end of the 1966 season. Long a champion of the American player, he stoutly maintained that the American boys were as good as his Canadian counterpart if given the opportunity. In accordance with his philosophy, his teams at Minnesota were almost exclusively American in make-up. His most memorable Gopher team was the 1954 squad which went all the way to the NCAA finals before bowing to Rensselaer Polytechnic Institute, 5-4, in overtime. Shortly after his birth, George Owen’s parents moved to the Boston area, where young George grew up and learned his hockey. He attended Newton High School and went on to Harvard in the fall of 1919. 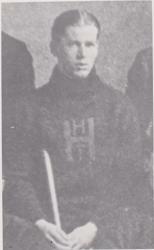 There, he captained the Freshman team and later served two terms as varsity captain, a relatively rare feat at Harvard. As a college hockey player, he was equally at home on defense or at center. Owen also played football and baseball for the Crimson, serving as captain of the latter during his senior year. Following graduation, Owen entered the brokerage business and continued to play hockey with distinction for the strong Boston University Club. He was invited to play for the United States Olympic Team in 1924, but was forced to decline because of business obligations. So strong a player was Owen, that the Boston Bruins signed him as a professional at the relatively late age of twenty-six. 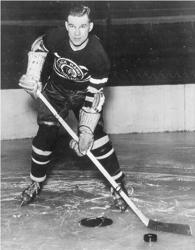 He played five seasons with the Bruins teaming at various times on defense with both Lionel Hitchman and Eddie Shore. 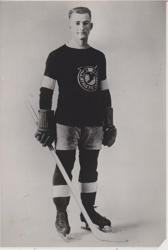 Owen was also a member of the 1929 Bruins team which won the Stanley Cup. He enjoyed his finest Stanley Cup Series in 1931 when he had two goals and three assists in a five game losing series to the Montreal Canadiens. His goal in the fourth game iced the victory for Boston. A high scoring defenseman in the days of the 44 game schedule. Owen scored 46 goals and 38 assists in five years of regular season and playoff action. 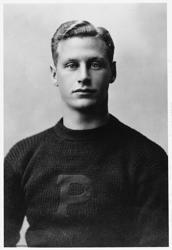 Ding Palmer was the all-time leading goal scorer in the history of Yale University hockey, notching 87 goals from 1928-30. At one time, he also picked up nine assists and ranked no. 4 on the all-time Yale point list with 96. It was freely admitted that assists were not recorded with the same detail as they are now. Palmer played on varsity squads that lost just six games in three years. In 1927-28, the Elis were 13-4-0, but improved that to 15-1-1 in 1928-29. The 1929-30 team called the “greatest amateur hockey team in history” by E.S. Bronson, was 17-1-1. The teams Palmer played on posted an aggregate record of 45-6-2 during his three years. During the Harvard series in his senior year, he played outstanding defensively as well as offensively. His junior season was marred by illness; plagued by the flu, he played in just about half the schedule. After leaving Yale, Palmer played on the 1932 United States Olympic Team which garnered a silver medal at Lake Placid, and on the 1933 National Team which won the World Championship at Prague, defeating Canada 2-1 in the final epic game. Doc Romnes broke into the NHL at a time when there were but two American Born players in the league. Fortunately for him, the Chicago Blackhawks Team which he joined, got off to a bad start and Romnes got a chance at Center and played regularly thereafter. Romnes played high school hockey in White Bear Lake and St. Paul, as well as a year at St. Thomas College, before joining the professional St. Paul Saints in 1927. It was after three years with the Saints that he made the jump to the big time. Romnes played in the Stanley Cup finals on four different occasions: 1930-31, 1933-34, and 1937-38, all with Chicago, and 1938-39 with the Toronto Maple Leafs. He was a winner in 1933-34 with fellow enshrinee Taffy Abel and in 1937-38 with enshrinees Cully Dahlstrom and Mike Karakas. The saga of the 1937-38 team stands out particularly in Romnes career because of his uncharacteristically violent encounter with Toronto defenseman Red Hoerner who broke his nose in five places. Ironically both were teammates in Toronto the following year when Romnes scored the winning goal in the Leafs only victory over the Boston Bruins in the Stanley Cup finals. In all of Romnes regular and playoff career he drew 46 penalty minutes in 403 games. In 1935-36 he won the Lady Byng Trophy scoring 13 goals and 25 assists along with six penalty minutes in the then full forty-eight game schedule. The Lady Byng Trophy is awarded to the player adjudged to have exhibited the best type of sportsmanship and gentlemanly conduct combined with a high standard of playing ability. 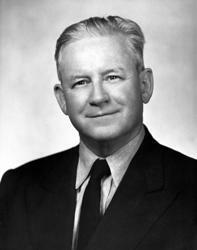 After the 1940 season, Romnes retired and coached Michigan Tech until 1945. He led the Kansas City Plamors to the United States Hockey League Championship and Playoff Title in 1945-46 and then coached the University of Minnesota varsity from 1947 until 1952. 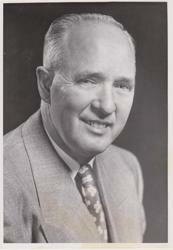 Cliff Thompson coached Eveleth High School from 1920 to his retirement in 1958. During that time, his teams won 534 games while losing on 26 and tying 9. The highlight of Thompson’s career came during the years 1948-51 when his teams won 78 straight victories including four straight Minnesota state championships. Eveleth won the state title a total of five times under Thompson’s leadership. Simultaneous to his high school coaching, Thompson also handled the Eveleth Junior College team compiling a career record of 171 games won and 28 lost. Generations of Eveleth youngsters received hockey instruction from Cliff Thompson, and in addition to his giving them the best hockey leadership, he was the object of deep affection that only boys can have for a man as close to them as their coach and teacher. Many stories are told how Thompson helped dozens of youngsters get a good pair of skates during the depression. When it came to equipment for his players, he was a stickler for the very best available. Eveleth’s claim to hockey fame can be traced to Cliff Thompson’s efforts in player development. No less than eleven Eveleth players went on to perform in the NHL and virtually all of these played for Thompson. Foremost among these were Frank Brimsek, Boston Bruins; Mike Karakas, Sam LoPresti, and John Mariucci, Chicago Blackhawks. Other outstanding Thompson-developed players who went on to college and National/Olympic Team stardom were John Mayasich, Minnesota; John Matchefts and Willard Ikola, Michigan. Thompson was honored by the presentation in 1951 of a trophy at the Sportsman’s Show in Minneapolis for his coaching record and efforts in training hockey players in good citizenship as well as athletics. He was made an honorary member of the American Hockey Coaches Association in 1957, one of only 36 men are so honored. William Thayer Tutt of Colorado Springs, Colorado was president of the El Pomar Foundation and the Broadmoor Hotel, Inc. and its related companies. It was while serving in those capacities that Tutt exercised his administrative abilities in hockey. During the 1947-48 college season, a group of coaches including Vic Heyliger, then of Michigan and later the Air Force Academy, approached Tutt concerning the sponsorship of a National Collegiate Athletic Association (NCAA) hockey tournament. Tutt agreed to provide his backing and thus college hockey was launched as a truly national sport. The tournament was held at the Broadmoor Hotel from 1948 through 1957, returning there in 1969 for a one year stand. Since 1958, the tournament was moved around the country to various college hockey hotbeds. 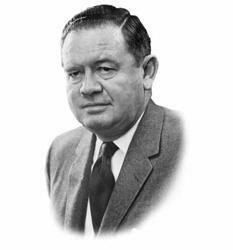 Thayer Tutt was generally regarded as the “Father of the NCAA Hockey Tournament” for his pioneering work for the college game. Turning his attention to international hockey, Tutt was also a United States member or President of the International Ice Hockey Federation for years. The long period of time was characterized by the increasing visibility of the international game which was brought to a dramatic forefront by the Russia-Team Canada series in September 1972. Long interested in youth hockey in this country, Tutt succeeded his long time friend, Tom Lockhart, also a United States Hockey Hall of Fame enshrinee, as President of the Amateur Hockey Association of the United States in June 1972. Tutt was North American Vice President of the International Ice Hockey Federation. He was also very active in the U.S. Olympic Committee, National Cowboy Hall of Fame, golf, and figure skating. The dominating figure of the first twenty years of Harvard hockey was without question Ralph Winsor, Class of 1902. The early period of Harvard hockey might well be called the “Winsor Era”. He played in 1901 and captained the 1902 team. Then he coached with outstanding success from 1902 to 1917, during which time Harvard had 124 wins and 29 defeats. The teams of 1903, 1904, 1905, 1906, 1909 and 1919, when he was assistant coach, were undefeated. Over these years he compiled a 23 win 5 loss record against arch rival Yale. As might be expected, Winsor developed many stars. Foremost among them was S. Trafford Hicks, Class of 1910, and captain of the 1910 team. Another was Morgan B. Phillips, Class of 1915, who tallied nine goals in games against the Eli. Winsor was an innovator who took part in the development of the modern hockey stick and shoe skates, as well as computing and adopting the official radii for the blades, known for years as the “Harvard Radius”. Many new tactics, such as back checking, and the shift of defensemen from point and coverpoint to the present paring positions are credited to Winsor’s genius. In all those years, it is reported that Winsor never took any money for his coaching duties, and his great modesty kept him from appearing in any team pictures. Besides his great contribution at Harvard, Winsor aided hockey at the school boy level and at other colleges. He had the distinction of coaching the United States Olympic Team at the 1932 games at Lake Placid, losing only once 2-1, to Canada in the final game. United States Hockey Hall of Fame enshrinees John Chase, John Garrison, and Ding Palmer were members of the 1932 team. Frank (Coddy) Winters started out as an ice polo player in his home town of Duluth, MN. As ice polo gave way to hockey Winters took up the game, being placed at rover where his great speed could be utilized to the best advantage. 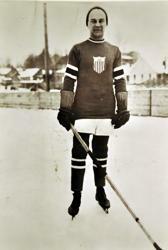 Winters played with the Duluth Northern Hardware team through the 1908 season during which the Duluth team played a series of games with a Cleveland All Star team at the new Elysium Rink there. Winters starred in the series and fell in love with Cleveland. That summer he moved there and played the rest of his career for various Cleveland amateur teams. From 1909-11, Winters played at rover and then switched to defense in 1912. There he proved to be just as good in checking opponents as he had been in carrying the puck down the ice. During Winters’ seventeen year career in Cleveland he played on three championship teams 1911-12, 1913-14, and 1921-22. While playing in Cleveland Winters coached the Case Tech teams and made several trips to Philadelphia to coach the University of Pennsylvania team. Though having the opportunity to turn professional he preferred to remain an amateur. There were many who felt Winters was equal in talent to Hobey Baker, also an enshrinee of the United States Hockey Hall of Fame, who many regard as one of the greatest American bred hockey players. Following his retirement from the game Winters remained in Cleveland working in the sporting goods business. Lyle Wright was identified with organized hockey from the first moment it existed in Minneapolis and remained identified with it, in one capacity or another, until his death. Wright served in the Canadian artillery in World War I and moved to Minneapolis in 1919. 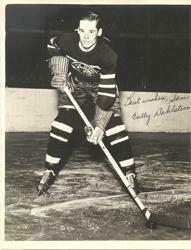 After four years of playing hockey himself, he brought the famed Ching Johnson from Eveleth to Minneapolis to play for the Minneapolis Millers. He managed the Millers, then playing in the American Hockey Association from 1928 until 1931 when he moved to Chicago to become business manager of the Blackhawks. He returned to Minneapolis in the early 1930s and remained there for the remainder of his life serving in varying capacities with the Minneapolis Arena eventually attaining the office of president. Over the years of his affiliation with the Minneapolis Arena, he was involved with the minor professional Minneapolis Millers almost continuously during their existence. But the Millers were not his only hockey interest. It was at the Arena that University of Minnesota hockey got its start, justifying the construction of a hockey arena on campus. It was also at the Arena that through Wright’s cooperation high school hockey flourished to become a major high school sport. Wright’s friends described him as a “practical promoter, a man with bold ideas, and a skilled organizer.” In hockey, he was an advocate of more scoring, less padding for goalies, and the determination that Minneapolis was a major league town. He was instrumental in bringing the Millers such hockey greats as Tiny Thompson, Stew Adams, and United States Hockey Hall of Fame enshrinee Taffy Abel. In addition to hockey, Wright was also involved in figure skating, the Ice Follies, and the Minneapolis Aquatennial.